To prepare the dish, salted cod or Haddock is sautéed with boiled ackee, onions, Scotch Bonnet peppers, tomatoes and spices. It is typically served as a breakfast along with bread (typically had dough bread), breadfruit, , dumplings, fried plantain, or boiled green bananas. 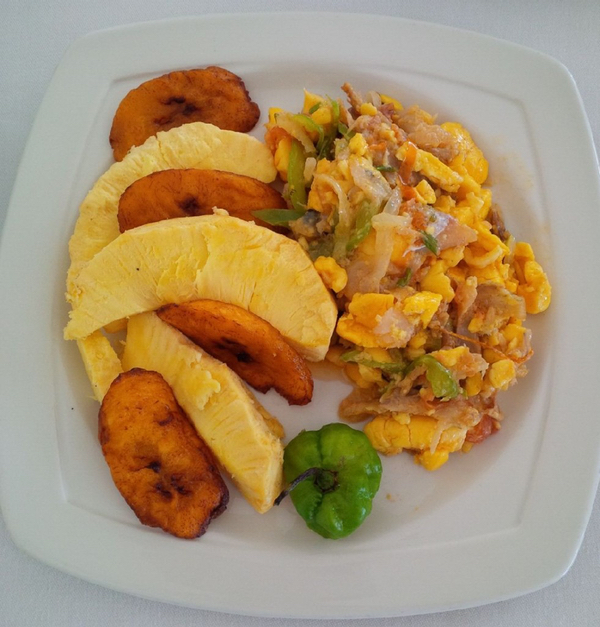 Ackee and Saltfish is also served along with rice and peas or plain white rice. Put saltfish to soak in cold water for about 1 hour. Pour off water; add fresh water and boil until tender. De-bone and flake the saltfish. Heat oil and sauté onion, garlic, scallions, tomatoes, scotch bonnet pepper and sweet pepper until tender, about five to six minutes. Add flaked saltfish, fresh or canned ackee and black pepper. Toss lightly; cover and allow to stand over low heat for about 2 minutes.